So it’s officially fall, but let me just tell ya, it doesn’t feel like fall at all here in Ohio. Even though my porch is peppered with pumpkins and mums, the weather feels more like late July with temperatures in the mid to high 80s. It just feels wrong to be sipping a pumpkin spice latte while blasting my car’s AC, so that I don’t sweat through my clothes on the way to Target. Even though Elle is loving the fact that she can still play in her kiddie pool and wear her favorite summer dresses, I’m officially over summer. Bring on the pumpkin pie, colorful leaves, and chilly air, please. Last week I stopped at a little roadside farm stand to pick up mini white pumpkins and browse the corn stalks (yes, I am that person – our house is already completely decorated for fall) and grabbed some fresh sweet corn and zucchini. Since I’m the only one in my household that likes zucchini in its natural state, I decided to shred some up for my favorite Chocolate Zucchini Cake recipe. Nothing like sneaking a little zucchini into a chocolate cake, right? I guess cake kind of defeats the purpose of eating a vegetable, but in my book vegetables = healthy. This cake has been on my blog since 2009 and was definitely in need of new photos and text. I haven’t made it in a couple of years, so I forgot how absolutely delicious it is. If you have a chocolate lover in your life, this is a must-make even if that chocolate lover happens to be a zucchini hater. I promise, they won’t be able to detect it – especially if you shred it super fine. The cake comes together quickly and uses pretty common ingredients, which is always a bonus in my book. 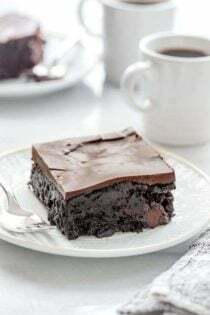 If you don’t have Dutch-Process Cocoa simple use your favorite unsweetened cocoa powder and add in an extra ½ teaspoon of baking soda to the dry ingredients. Easy-peasy and no need to make a special run to the store. This Chocolate Zucchini Cake is rich, ultra-moist and fudgy. 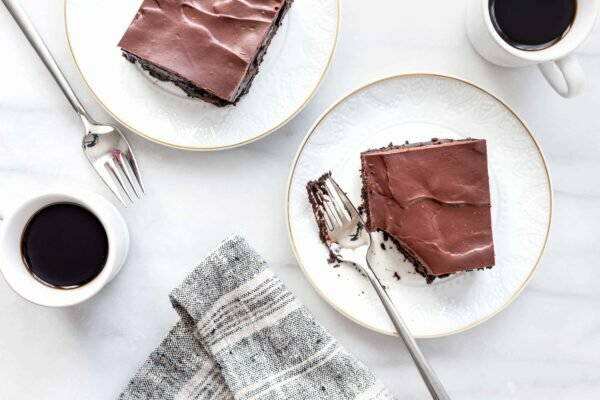 I’ve served the cake up naked with a simple sprinkling of powdered sugar, but it really reaches its full potential with a layer of silky ganache. I mean, more is always more, right? And if it’s blazin’ hot in your neck of the woods, a scoop of vanilla bean ice cream over a warm slice of this cake would be absolutely dreamy. It’s also great straight out of the fridge – seriously, you can’t go wrong with this cake! 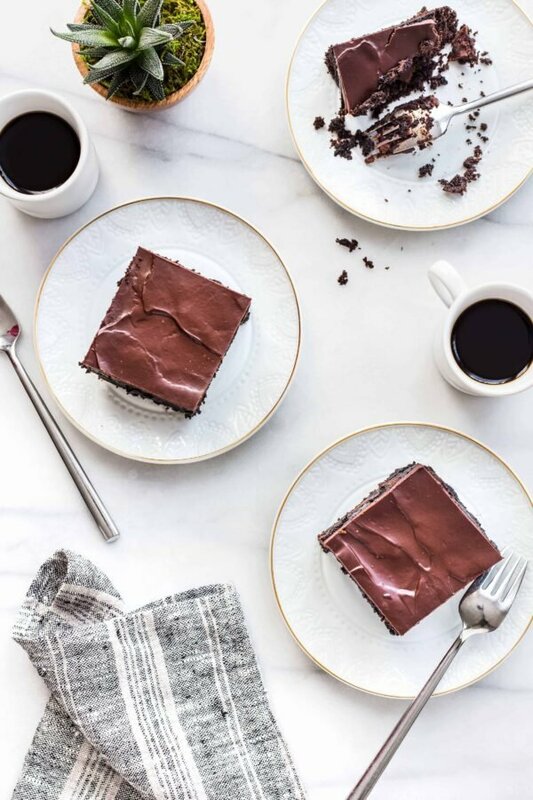 Whether you serve it up naked, with layer of ganache, or with a scoop of ice cream, I hope you make this Chocolate Zucchini Cake and enjoy it as much as we do! For more delicious zucchini desserts, be sure to check out this Chocolate Coconut Zucchini Bread, these Chocolate Zucchini Muffins and this Lemon Zucchini Cake. Preheat the oven to 325°F. Lightly grease a 9 x 13-inch pan. In a large mixing bowl, cream together the butter, oil, sugar, vanilla, baking soda, baking powder, and salt. Add in the eggs. Stir in the sour cream alternately with the flour. Then add the cocoa powder and mix until incorporated and the batter is smooth. Fold in the zucchini and 2/3 cup chocolate chips. Add the batter into the prepared pan and bake the cake for 30 to 35 minutes, till the top springs back lightly when touched. Place pan on a wire rack to cool completely. To prepare the frosting, heat the heavy cream in a saucepan over medium heat until simmering. Remove from the cream from the heat and pour it over the chocolate chips. Wait about 3-4 minutes then whisk to combine. It may take a few minutes of stirring for the ganache to come together, but I promise it will. The ganache will thicken as it cools. Allow the ganache too cool until just slightly warm and still pourable. Pour the ganache over the cake and smooth with offset spatula. Allow frosting to set for about 30 minutes before serving. *If you are using regular natural cocoa powder, add an additional 1/2 teaspoon of baking soda. Store leftover chocolate zucchini cake in the fridge for up to 3 days. This post originally appeared on My Baking Addiction in September of 2009. The photos and text have been updated. That looks incrediby delicious and rich and chocolately. YUMMY!!! I need to try this again! I just got done picking about 20 lbs. of zuchinni from my garden this afternoon- I'll definitely give this recipe a try! Looks great, I also recently blogged about a chocolate chip zucchini bread recipe that the kids go gaga over and never know it has veggies. I serve it as a breakfast treat!! I'm so pleased that so many food bloggers have made this after I posted it a few weeks ago. I'm even MORE pleased that it's worked out so well. Glad you liked it – and glad you utilized the KAF Baker's Hotline. I tell ya, those folks are THE BEST! I made this recently too and it is very yum! Thanks for letting me know about the KAF live chat. Too cool! That has to be the most incredible piece of cake Ive seen with zucchini! YUM!! I can totally see why this cake is so captivating. That is one decadent looking cake! I made this, too, after finding Em's cake and it really was an amazing chocolate cake. I thought it was great the next day, too, AND the ganache–awesome! By the way, I forgot to say, YOUR cake looks fabulous as well! Love the photo! I have never baked with zucchini before but this sounds (and looks) intriguing. Thanks so much for sharing. Glad we were able to support you in adapting this recipe. Check in anytime. Frank @ KAF, baker/blogger. Awesome pictures of a fantastically enticing cake! O Yes, I have died and gone to food heaven. This is one awesome cake.I usually hide the fact that the cake has zucchini within from my kids. This they would gobble up even if I yelled 'IT'S GOT ZUCCHINI INSIDE'! It's gorgeous & so are your pictures! That looks soooooo super chocolatey and sinful! Guess what I am eating at this very moment? Oh yeah- that cake. I need to buy more zucchini and freeze a few cakes. Goodness! Zucchini does really add a fabulous moistness to cake. This is one gorgeous cake! And that frosting! Wow! I so want a slice of this. Just stunning! I made this cake recently too and oh man, was it ever delicious! I never would have known there was zucchini in it. Yours looks perfect! FABULOUS and I did a couple things differently…. I used coconut oil for the vegetable oil and instead of zucchini I used grated and drained APPLE. It was great! I also make this from KA flour. Like Joan I use coconut oil instead of veggie and I only had half stick of butter so I added extra yogurt, it was fine. I also use 2 packed heaping cups of zucchini- it’s soooo moist and wonderful. I made it 3 times this summer. We have a thing for cream cheese frosting so I did that, then I did a yogurt (using Fage) frosting that was great. Looks great, I’m baking it now. However………. – How is 3/4 cup Dutch cocoa equal to 2-1/4 ounces? In my kitchen, 3/4 cup is 6 ounces! – and, 1/2 cup chocolate chips is 3 ounces? Your conversion of measurements is confusing!! Please address this? HI! Is it possible to substitute gluten free flour in this? I am not a gluten free baker, so I honestly have no idea. I would assume it would work okay, but it might be worth asking a gluten free blogger about the recipe. Just what I was looking for! Thanks for the conversion, too! Is it possible to sub the eggs out with applesauce or banana? I think 1/4 cup of applesauce can be substituted for each egg. Thanks for stopping by. 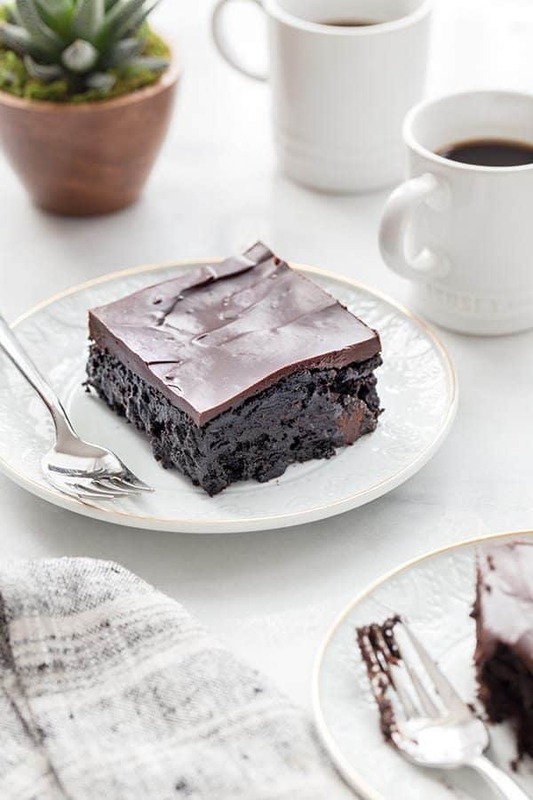 We’re all for anything that is this rich and chocolatey and sneaks in some veggies too. Great recipe! I just made this same cake last week for book club, but sent it over the top with German Chocolate Frosting. We stopped talking about the book once the cake was served! My recipe came from an old church cookbook, but was almost identical, called for sour milk instead of sour cream, but I substituted the sour cream. Can’t wait to try with the ganache. I’m glad the recipe was such a hit with your book club. Thanks for stopping by! My son loved this cake (and he hates zucchini). hee hee hee. Kids would never suspect the zucchini! Thanks for stopping by. I put this cake in an 8 inch round wilton cake pan, it’s been in the oven for well over 50 minutes. Am I doing something wrong!? This recipe calls for a 9×13 inch pan, not an 8-inch round pan. The area of the pan you used in much smaller than a 9×13. I hope this helps you problem solve the overflowing cake. This cake is awesome! I got the recipe from your site in 2009, and have been making it since. We plant zucchini and always end up with more than we can eat, so I decided to make it that year, and am so glad I did! It is the most moist cake I have ever eaten, and the ganache is the perfect topping! Family and friends rave about how good it is! So happy to hear you’ve enjoyed the recipe since way back in 2009. It’s one of our absolute favorites! I love that you use homegrown zucchini – I bet that makes it even more special! I made this today because I have a lot of zucchini coming out of the garden. I omitted the oil, reduced the sugar to 1 cup, swapped Greek yogurt for sour cream. I baked it in a bundt pan for 40 minutes at 325 F. I think it should have stayed in the oven for 5-10 minutes longer & been perfect. I really like this recipe and the ganache is perfect! So happy to hear you enjoyed the cake, Julie! Thanks so much for stopping by and leaving your feedback! Jamie, Is this the same cake that you baked in a bundt cake pan? I swear at one time on my pinterest board I had a recipe from you for a chocolate zucchini bundt cake. It was an all time favorite and now I can’t find it. Thanks so much for stopping by, Nicole! I actually don’t believe I’ve ever made a chocolate zucchini bundt cake. I appreciate you taking the time to comment. Happy Baking! So happy to hear you enjoyed the cake, Sanya! Congrats! Thanks so much for stopping by and leaving your feedback! I LOVE hidden vegetables. This sounds crazy but I’ll have to try it! Loving your blog. Thanks so much for stopping by, Emma-Jane! I appreciate you taking the time to comment. Happy Baking!